Lt. William Calley during his court martial in 1971. Two young women look at photographs showing massacre scenes as they tour the My Lai Massacre Museum at My Lai village in the central province of Quang Ngai. 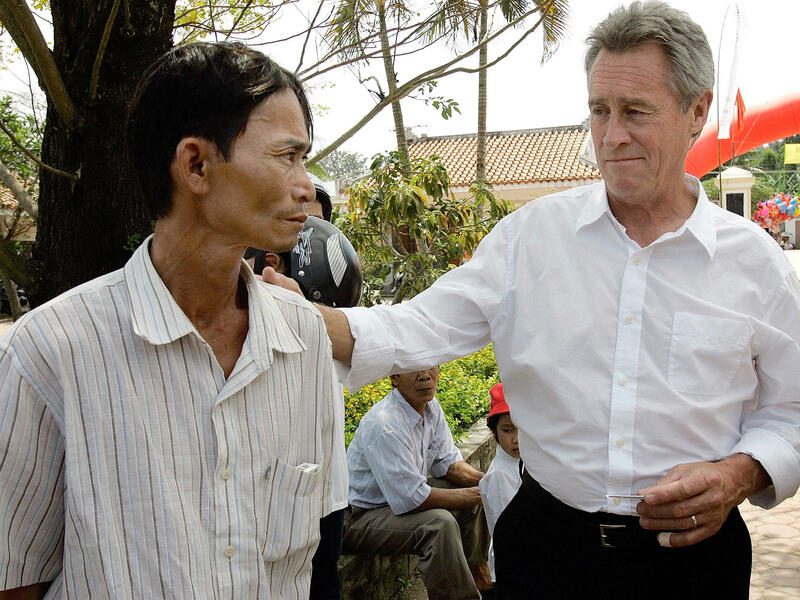 My Lai Massacre survivor Do Ba, 48, left, of Ho Chi Minh City, meets with former U.S. Army officer Lawrence Colburn, 58, right, of Canton, Ga., on the 40th anniversary of the massacre. Colburn and his fellow helicopter crew members rescued Do Ba during the massacre. Children perform at a war memorial dedicated to the victims of the My Lai massacre in the village of Son My during a ceremony marking the 50th anniversary of the massacre on March 16, 2018. "And they walked away. And as we took off, we heard machine gun fire.
" 'My God, they're shooting into the ditch.' And then that's when there was no use fooling ourselves anymore about what was going on," Thompson said. 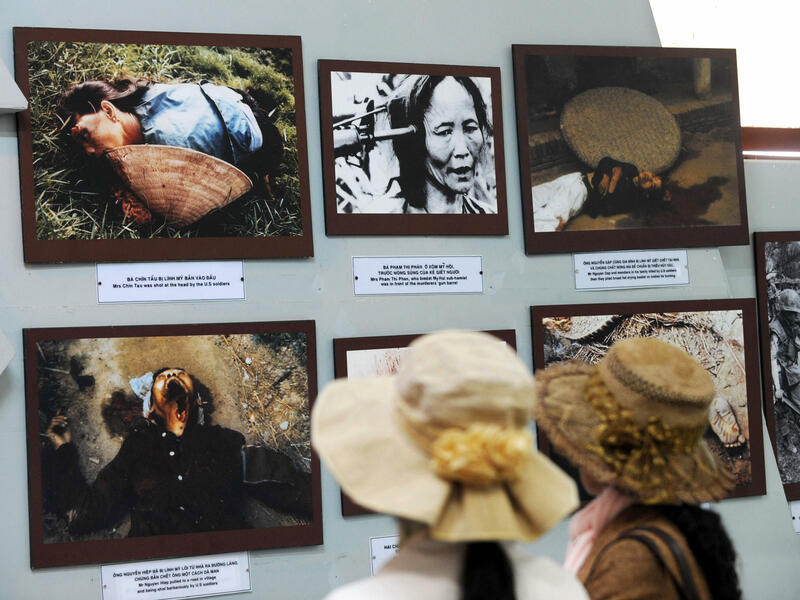 Thompson had interrupted what would later be known as the My Lai massacre, which remains one of the darkest chapters in the long history of the United States military. The night before, Army Capt. 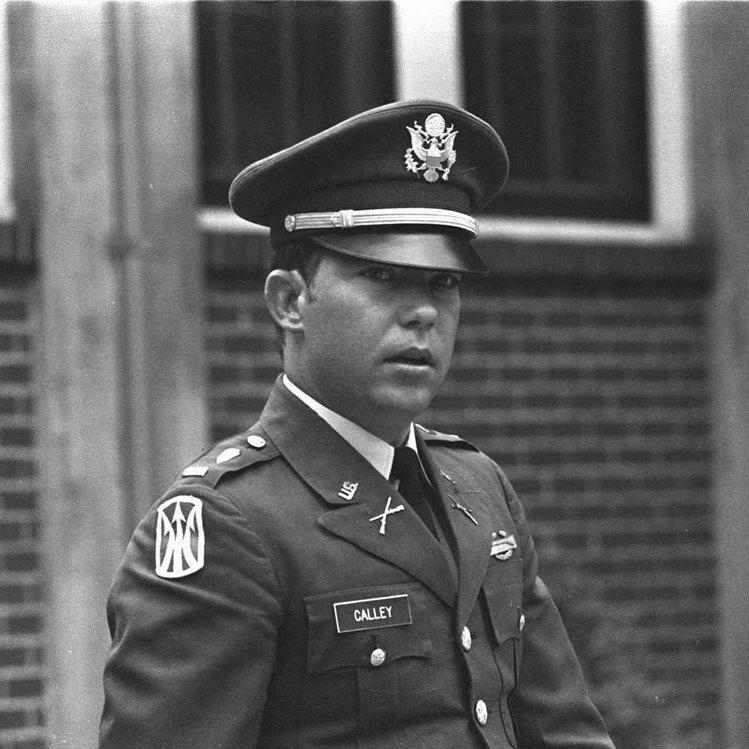 Ernest Medina told his soldiers that a string of hamlets, including My Lai, would be full of enemy troops and empty of civilians. When they landed, it turned out to be the opposite. But Charlie Company, encouraged by a young lieutenant named William Calley, spent four hours murdering civilians and burning their homes. Soldiers later admitted women were raped and mutilated. More than 200 children, many of them herded into a ditch, died in a spray of machine-gun fire. At first the Army tried to cover it up, but journalist Seymour Hersh broke the story in November of 1969. Now it's part of the curriculum at the military service academies. Air Force Maj. Logan Sisson teaches ethics at the U.S. Air Force Academy in Colorado Springs. He shows his students a picture he took with Hugh Thompson and his door-gunner Larry Colburn. 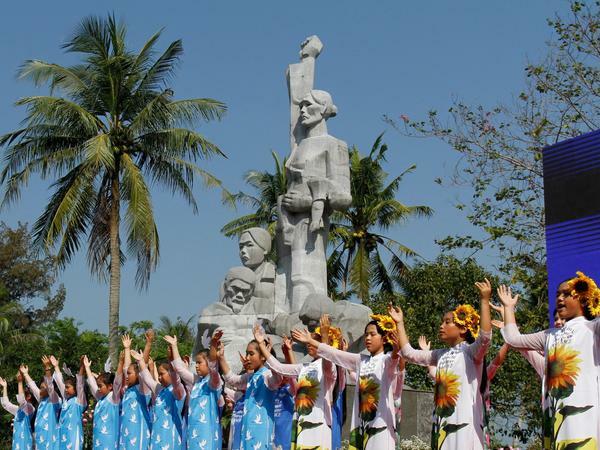 "If we can use the term heroes, if there were any heroes at My Lai, it was them," says Sisson. Once Thompson, Colburn and their crew chief Glenn Andreotta realized what was happening, they landed their chopper in between the troops of Charlie Company and the civilians. Thompson ordered his gunner to shoot any Americans who continued to murder civilians. Thompson flew several Vietnamese civilians out to safety, including a nine-year-old boy sitting in his crew chief's lap. It took 30 years for the Army to recognize the three members of the chopper crew as heroes. In 1998 they were awarded the Soldier's Medal, which recognizes heroism not involving conflict with the enemy. Fifty years ago, they got no such praise. When Lt. William Calley went on trial, Hugh Thompson was shunned for testifying against him. Calley was the only person punished for the massacre - and public opinion back home supported him. There was even a song, that made the Top 40 in 1971. That public support made it easy for President Richard Nixon to reduce Calley's sentence to house arrest. He served only three-and-a-half years. Calley is still alive and lives in Georgia. That's also a lesson of My Lai - there was little accountability. John Sifton of Human Rights Watch researched war crimes in Iraq and Afghanistan. He points to the Haditha massacre in Iraq in 2005. U.S. Marines killed 24 civilians, including women and children, after a bomb attack on their unit. "In the end only one person was held accountable and it wasn't a very serious punishment," says Sifton. There were eight courts martial, but only one conviction, which ended in a plea deal with no prison time. Sifton says the military justice system usually gives senior officers a pass. And without real punishments, he says, abuses will continue. "Officers at the Bagram Air Base in Afghanistan - where there were also serious abuses including several deaths in custody - the officers involved in it got away with it. And later went to Iraq, where they committed abuses!" says Sifton. Ike Wilson, a former Army colonel who served in Iraq and Afghanistan, says Haditha isn't comparable to My Lai, but soldiers still need to study it. "I know through my whole 33 years of professional military service, both soldiering and as a professor at West Point, My Lai has been a centerpiece with regard to the ethics of war," says Wilson. Wilson says My Lai spurred changes like ending the draft; volunteer officers are much better trained and educated. But he says the modern high-tech military isn't immune to the risk. There's a museum in My Lai now, with a plaque listing all the names and ages of the 504 people killed that day. American tourists, including Vietnam vets, regularly visit. And back at the Air Force Academy, Maj. Sisson is asking an ethics class about My Lai. "Who are going to be our future heroes? Hopefully we can prevent this, but who are going to be the heroes to stop it once it starts?" says Sisson. His class is young but not naïve. They recognize that the U.S. military could easily cross the line again. "I think the difference is that America owned up," he says, "And that's why we're talking about it. We're not pushing it underneath a rug." The audio version of this story included excerpts from the 1970 film, Interviews with My Lai Veterans, produced and directed by Joseph Strick. Audio courtesy of the Academy Film Archive. The film received the Oscar for documentary (short subject). All this year NPR's looking at the tumultuous events of 1968 that continue to shape our lives. Fifty years ago today in what is now known as the My Lai Massacre, American soldiers in Vietnam killed more than 500 civilians in four hours. It remains one of the darkest chapters in the history of the U.S. military. At the nation's service academies, that massacre is now part of the curriculum, which is where NPR's Quil Lawrence begins his report on My Lai 50 years later. LOGAN SISSON: First of all is discrimination. What is discrimination all about between civilians and other soldiers or combatants and noncombatants? QUIL LAWRENCE, BYLINE: Major Logan Sisson is teaching a class on the laws of war to cadets at the U.S. Air Force Academy in Colorado Springs. A lot of that boils down to basic questions. Who must you protect and whom can you shoot? UNIDENTIFIED STUDENT #2: Like, what are legitimate targets and what's not? LAWRENCE: He lays out scenarios for discussion, things these cadets might someday have to decide. One involves an enemy commander, a legitimate target for an airstrike. SISSON: Unfortunately, he'll be traveling with an entourage which includes two members of his operations staff, five bodyguards, two wives and three children. LAWRENCE: Cadet Meghan Guinee asks about the target's value. MEGHAN GUINEE: What does he provide for the war effort again? LAWRENCE: Cadet Bridger Barker says no. BRIDGER BARKER: I'll probably go no because of due care, because we will kill his children and his wives. They're noncombatants. LAWRENCE: Cadet Lydia Knutson is leaning yes. LAWRENCE: The talk is hypothetical. This class hasn't studied My Lai yet. BARKER: Was that where it was in Vietnam where we had some of our American soldiers killing civilians and a couple of the officers told them that if you kept killing civilians we're going to start killing you? LAWRENCE: Not exactly. On March 16, 1968, Army Captain Ernest Medina told his soldiers that a string of hamlets, including My Lai, would be full of enemy troops and empty of civilians. When they landed, it turned out to be the opposite. But Charlie Company, encouraged by a young lieutenant named William Calley, spent four hours murdering civilians and burning their homes. Michael Bernhardt and Gary Garfolo were in Charlie Company that day. MICHAEL BERNHARDT: You know, this is going to be a free-for-all. You can shoot anything you want, anything that moves. GARY GARFOLO: He said, shoot everything - man, woman, children and the whole bit, everything that could - A to B, C. You know, every living thing. That was sort of like the order. Some guys might have just flipped. There's people that are capable of doing that under those conditions. BERNHARDT: What in effect he said was then the village would be destroyed and all the people in it and so on. LAWRENCE: These recordings come from the Oscar-winning documentary "Interviews With My Lai Veterans." Vernardo Simpson is another soldier featured in that film. VERNARDO SIMPSON: Our captain, Medina, was telling us about we was going in and burn down and kill everything that was in the village, and that we would leave nothing standing there. That's women, children, babies, cows, cats - anything. And when we got off the chopper, we started shooting. And this lady got up. And she ran and turned - had her back turned to me. And my platoon leader, Lieutenant LaCross, told me to shoot her. And I said, no, well, you shoot her. I don't want to shoot no lady, you know? So he said, well, I'm giving you a direct order to shoot, and if you don't shoot her that you're going to be shot yourself. So as she be putting her foot in the door, I shot her about five or six times. And I went there and turned her over, and there was a little 3-month-old baby. LAWRENCE: Simpson said the baby was dead. Other soldiers say women were raped and mutilated. More than 200 children, many of them herded into a ditch and machine-gunned. Journalist Seymour Hersh broke the story in November of 1969. At first the Army tried to cover it up. Now the military teaches it at West Point, the Naval Academy in Annapolis and here at the Air Force Academy. LAWRENCE: It's a different class later in the day, and Major Sisson has now taken out a picture of himself standing next to two Vietnam veterans. SISSON: I got up here a picture of me with - on the - my right is Hugh Thompson and on the left is Larry Colburn. If we can use the term heroes - if there were any heroes at My Lai, it was them. LAWRENCE: Hugh Thompson was a chopper pilot. He died in 2006, but here's an old interview he gave NPR. HUGH THOMPSON: So we then stepped down. Two guys, I think it was, came over to the aircraft. And what do y'all want? You know, well, there's some civilians over in that ditch. You know, can you help them out? And they said, well, we can help them out of their misery. Oh, man, come on. Quit joking around. How about helping them out? Yeah, OK. Then they walked away. And as we took off we heard machine gun fire. You know, I said, my God, they're shooting into the ditch. And then that's when there was no use fooling ourselves anymore about what was going on. SISSON: Hugh Thompson landed his helicopter between American soldiers and civilians. And he said to Larry Colburn, his gunner, point your gun that way. And if they shoot any more civilians, shoot them. LAWRENCE: Thompson and Larry Colburn and their crew chief, Glenn Andreotta, are heroes today. But it took 30 years for the Army to recognize that with the Soldier's Medal awarded in 1998. It was different 50 years ago. When Lieutenant William Calley went on trial, Hugh Thompson was shunned for testifying against him. Calley was the only one punished for the massacre and public opinion supported him. There was even a song that made the Top 40 in 1971. TERRY NELSON: (Singing) My name is William Calley. I'm a soldier of this land. I've tried to do my duty and to gain the upper hand. But they made me out a villain. They have stamped me with a brand as we go marching on. LAWRENCE: That public support made it easy for President Richard Nixon to reduce Calley's sentence to house arrest. He served only 3 1/2 years. He's still alive and lives in Georgia. There was little accountability. And that's another lesson from My Lai which still resonates. John Sifton of Human Rights Watch researched war crimes in Iraq and Afghanistan. He points to the Haditha massacre in Iraq 2005. U.S. Marines killed 24 civilians, including women and children, after a bomb attack on their unit. JOHN SIFTON: In the end, only one person was held accountable. And it wasn't a very serious punishment. LAWRENCE: Sifton says the military justice system usually gives senior officers a pass. And without real punishments, abuses will continue. SIFTON: There were officers at the Bagram air base in Afghanistan where there were also serious abuses, including several deaths in custody. The officers who were involved got away with it. And they went on to Iraq where they committed abuses. LAWRENCE: Haditha is not comparable to My Lai, but the point is soldiers should still study it, says Ike Wilson, a former Army colonel. IKE WILSON: I know through my whole 33 years of professional military service, both soldiering as well as a professor at West Point, My Lai's been really a centerpiece with regard to the ethics of war. LAWRENCE: Wilson served in Iraq and Afghanistan. He says My Lai spurred changes like ending the draft. Volunteer officers are much better trained and educated. But he says the modern high-tech military isn't immune to the risk. WILSON: Ten thousand miles away, prosecuting warfare through the activities of armed drones - might that be the new face of potential My Lais of our contemporary times in the future? LAWRENCE: There's a museum in My Lai now with a plaque listing all the names and the ages of the 504 people killed that day. American tourists, including Vietnam vets, regularly visit. And back at the Air Force Academy, Major Sisson is wrapping up his lesson. SISSON: Who are going to be our future heroes? I mean, hopefully we can prevent this in the future. But when we can't, who are going to be the heroes to stop it once it starts? LAWRENCE: Cadet John Wendt has an answer of sorts. JOHN WENDT: Throughout history, militaries, no matter how good or how benevolent, have always slipped up at some point. And I think the reason why America's military's different is that America owned up and we said, we're going to fix this. We're going to try and be better than that. And I think that's why we're talking about it. You know, we're not pushing it underneath a rug. LAWRENCE: And the class is dismissed. Quil Lawrence, NPR News, Colorado Springs. (SOUNDBITE OF PAUL SIMON SONG, "SOFT PARACHUTES") Transcript provided by NPR, Copyright NPR.